Police investigating the case of a dead baby found at a New York recycling plant are looking to talk to a mystery woman who was spotted at a memorial service for the child. Investigators are asking the public for help identifying and finding the woman, and have released video of her. They stressed Friday that they only want to question her. The woman, wearing a white hoodie and jeans and carrying a gray handbag, was seen on video at the service at St. Joseph's Church in Elmsford on Nov. 23, police said. 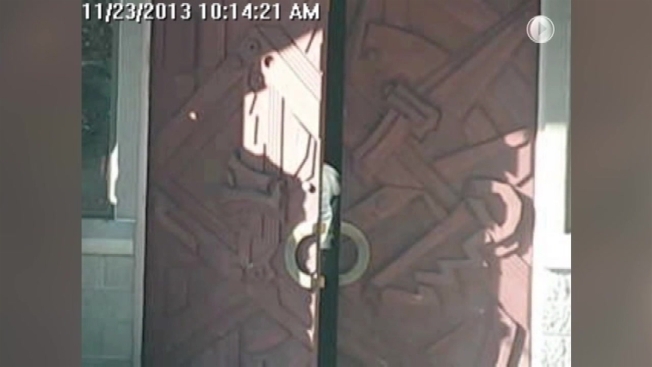 She appears to open the door and enter the church, but then turns and leaves. Investigators looking for the mother of the dead baby found inside a plastic bag at a Westchester recycling plant last week say she may herself be a victim of a crime. Rob Schmitt reports. "It seemed to us that she was disturbed by something, or emotional over something that had occurred," said Detective Sgt. James Noble, of Spring Valley police. "She attempted to go in the church and basically ran out rather quickly. "We're just basically looking to see what happened, what sparked that." The baby boy, dubbed by police as "Baby Angel," was found inside a plastic bag mixed among cardboard at the Brookfield Recycling Plant in Elmsford last week. The baby was born full-term then killed, according to investigators. Police have previously said that they weren't sure if the mother herself may also have been the victim of a crime. Investigators think the woman whose dead baby was found at a Westchester County trash facility might be from Spring Valley. Rob Schmitt reports. "We don't know if she's also a victim somewhere that needs assistance or possibly the victim of another homicide," Spring Valley Police Chief Paul Modica said last month. After tracing the plastic grocery bag that contained the baby, detectives think the newborn was dumped in the trash at a deli on Maple Street in Spring Valley, then carried by a garbage truck to the recycling plant. Police have also released photos of a black skirt and a towel with a floral design found with the baby in hopes someone would recognize the items and help identify the mother. Anyone with information is asked to contact New York State Crime Stoppers at 1-866-313-TIPS or nyscrimestoppers.org.